In this hilarious video from Aaron Mate, MSNBC’s Rachel Maddow is literally corrected in real time by her producers. On her program she claimed that William Barr was doing the redaction’s by himself, literally lying on the air. As you can see in the hilarious video, as soon as she starts spewing her rhetoric and lies, her producers correct her at the bottom of the screen, absolutely hilarious! 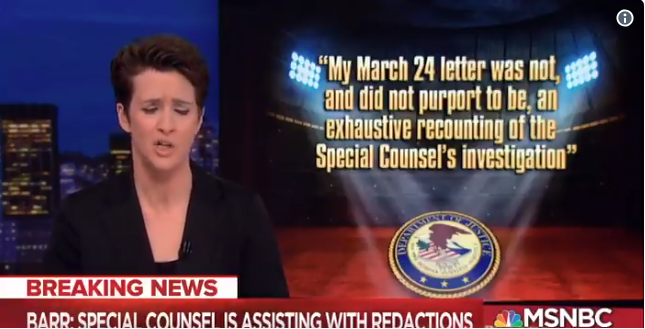 “Barr: Special Counsel is assisting with redactions” is quickly put on the screen below her as she’s screeching falsehoods. It’s always something special when you can see fake news happen in real time America.